Last week my brother Chun Chew (Zen) and I met up with two old friends from Braddell Rise School to reminisce about the old days in BRS. I brought along my precious report book to show off my fantastic grades – 2nd in class in Primary two Ok! But to my disappointment, they were more interested to pore over the teachers’ and principals’ signatures to try and decipher their identities. As always, I never fail to marvel at Aii Chan’s (Kim) fantastic memory for people. She also had a very good recollection of the tuckshop and even drew a sketch for us showing the location of every single stall. Me … I could only remember the drinks stall run by the lady every BRS boy loved – Fong Jie. We had our meeting in the hawker centre at Sembawang Hills Estate. We chose this place because Aii Chan and Sock Gek used to pass by it everyday on their way to school at Upper Thomson Secondary School from their kampong at Hai Lam Sua (near the present Lakeview Estate). Do you know where was this school located? When we arrived at this hawker centre, I noticed that there was a mini-wayang stage in the car park where they were rehearsing a puppet show. As far as I can tell, this puppet show was exactly the same as those that were staged in our kampong during the Chinese Seventh Month. Although most of the time they would stage the traditional Hokkien Wayang shows, occasionally I saw them perform puppet shows like this one. Where have all the squash courts gone? In my previous post, I mentioned that squash was very popular in Singapore in the late 70’s and 80’s. At that time, finding a squash court to indulge in our favourite sport was always a challenge. I took up squash during the tail-end of my OCS days in Safti. My section mate, Lim Kheng Guan taught me how to play the game. Subsequently when I was posted to 30 SCE in Mandai, I had more time to play the game. We did not have our own courts and had to go next door to use the one at 40 SAR. At that time, the SAF had plans to build at least two squash courts in every camp. 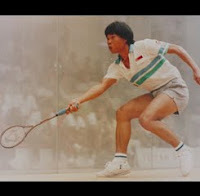 Elsewhere in Singapore, it was still very difficult to find a squash court, and so after my ROD, I often had to depend on my friend KG, who was a regular, to bring me to his camp at Selarang Barracks to play. He was the QM (quartermaster) in one of the SARs (Spore Armoured Regiment). He also brought me to SCSC (SAF Command and Staff College) at South Buona Vista occasionally. Mar 1978 (obviously posed) photo taken at Gillman Camp. Notice the wooden racket. My first racket was a Dunlop, a popular brand at that time. Another popular brand was Ascot. The design of the new squash courts in SAF was terrible. To access the viewing gallery, you had to climb a ladder – I repeat, ladder, not staircase. Thus whenever we brought lady friends along, it was quite inconvenient. When I started work in Philips (Audio Factory) in Toa Payoh, I was a member of the Sports and Recreation Club Committee. As squash convener, it was my duty to book the squash courts for our players. I usually went to the SSC (Singapore Sports Council) office in Kampong Java Road early on Thursday morning to book the courts there so that my colleagues and I could play on Saturday morning. There were two sets of squash courts in Kampong Java. One was near the KFC restaurant (A) along Kampong Java Road where the KK Hospital sits today. 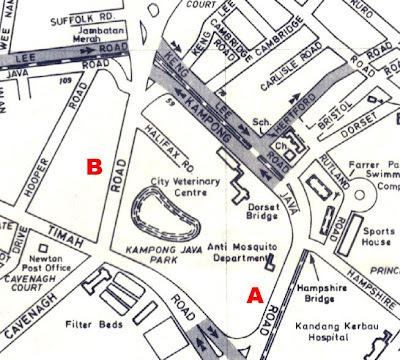 The other (B) was next to New Cemetery Road (later renamed Cavenagh Road) where there were many tennis courts. The design of the courts near KFC was even worse than those in the SAF.To get into the court, you literally had to stoop and crawl through a tiny door! Today, the squash and tennis courts at B would be sitting smack on the entrance to the CTE Tunnel. Occasionally, I managed to get another former army mate who was working at the HDB (Housing and Development Board) to book a court for us at the HDB Club. Do you know where that was? It was located at Toa Payoh Lorong 6; near to the stadium. I am not sure …. I think it was subsequently turned into the present Safra Club. Later on, I managed to secure a long term booking for a court at Anglo-Chinese Junior College. I remember on one occasion running into my former Add Maths teacher Mr Chee Keng Lim who had become the principal of ACJC. I often trained with my Philips colleagues – not just those from my factory, but also friends from other Philips factories, including those in Jurong. Once a year, we represented Philips in the Seira (Singapore Electronics Industries Recreation Association) inter-factory competition, playing against other MNC’s like HP, TI and National Semiconductors. Unfortunately, they only allowed one place in the team for the ladies because we had not 1 but 3 very strong lady players; and we never did very well in the competition. The Seira competition was usually held at the courts in Fort Canning or the East Coast Recreation Centre – next to the MacDonald’s restaurant. As I said, getting a squash court was very difficult in those days. And so if we knew any friends who had the ‘lobang’ we would ask them to bring us along. Thus I remember playing in places like the Shell Club in Pulau Bukum and Paya Lebar Road and others. One other place where I went to regularly was on the roof top of the PUB Building at Sommerset Road. My old friend Heng Tew used to work there and he would sign us in on Saturday mornings. We would also make use of the swimming pool there. 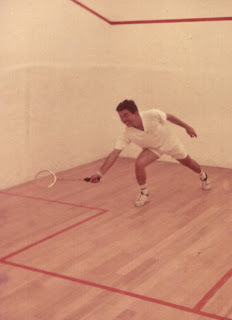 In 1986, when my new employers, NPB (National Productivity Board) moved to its own building in Bukit Merah Central, we finally had our own squash courts. I remember playing with one very famous ‘colleague’; our chairman Mr Mah Bow Tan, who was the minister-of-state for Trade and Industry at that time. In fact yours truly was the winner of the inaugural Mah Bow Tan challenge trophy. In the late 80’s, squash courts became widely available in the numerous condominiums and country clubs which had sprung up in Singapore. At the same time, the popularity of the sport waned. I often wonder; maybe Singapore would still be a top squash nation if we didn’t build so many condominiums. Maybe it is human nature that when good things are in abundance, they lose their attractiveness. Where have all the (Singapore) squash players gone? Squash was very much in the news last week because of the just-concluded CIMB Singapore Masters. The women's tournament was eventually won by Malaysia's world No. 1, Nicol David. Whenever I read news about this game which I used to love, I feel a certain sadness. I am sure many squash lovers of my generation feel that way too. Especially painful are reports of Malaysia thrashing us in a game that we used to dominate in this part of the world. I wonder if younger Singaporeans know that at one time, Singapore was one of the top squash nations in the world. I believe we were ranked within the top 10 in the world at one stage. In Asia we were second only to Pakistan. And we regularly won the East Asia Squash Championships. And of course, we routinely thrashed our arch rivals Malaysia in our annual encounter. In the late seventies, squash was immensely popular in Singapore. We had many outstanding young players. The most famous of course was 1986 Sportsman of the Year, Zainal Abidin. At that time we had not one, or two, but four young male squash stars. Let see if I can recall their names from memory. Besides Zainal Abidin, there was Peter Hill. Both of them turned professional subsequently. In those days, it took a lot of courage and commitment to become a professional sportsman. There were two other very young players by the names of Stewart Ballard and Jeremy Yeo. I remember being quite surprised to see Stewart Ballard for the first time because he looked like a Chinese. As for the ladies, the most famous was Lim Seok Hui. 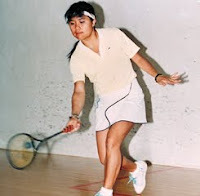 In 1984, at only 17, she became the youngest ever player to win the East Asia Squash title and was crowned Sportsgirl and Sportswoman for that year. Sadly, at the peak of her game, she quit the sport to pursue university education overseas. How sad that at that time we did not have the sport excellence incentives that we have today. On the international scene, the most famous players hailed from Pakistan. There were a number of them with names ending with 'Khan', the most successful being Jahangir Khan. But for many years, the Pakistanis were frustrated in their attempts to become world champion by an Australian called Geof Hunt. This guy who won the British Open (which was considered to be the effective world championship event involving both amateurs and professionals before the World Open began) eight times between 1969 and 1981.